This is one of my all-time favorite shots, captured at Latrobe's on Royal in the French Quarter. This was a daytime wedding, so even though this was an indoor shot, there was enough natural light streaming in through the window that faces Conti Street to illuminate the couple beautifully with no need to add supplemental lighting. 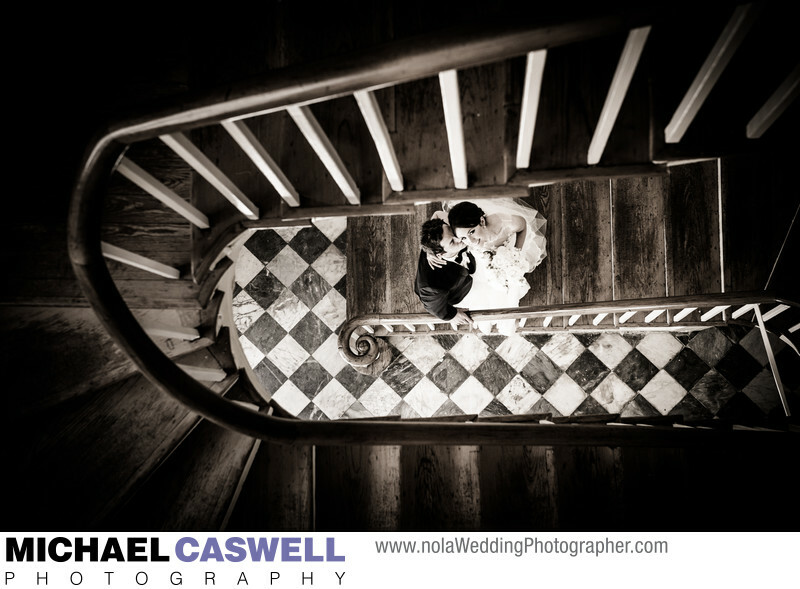 This couple's ceremony had taken place at Saint Charles Borromeo Catholic Church in Destrehan, Louisiana, and they set aside fifteen or twenty minutes of time upon their arrival at the reception in New Orleans for portraits of just the two of them around the vicinity, and I'm so glad they did. Some couples choose to do this during the reception while guests are eating dinner, but the time of day needs to be considered, as for evening weddings, it will typically be after dark by this time. Although the best light for these shots outside will about a half hour before sunset, interesting and dramatic portraits can be captured at night as well. Regardless, if these kinds of photographs are important to you, make sure to allow time for this session in your wedding day schedule, giving consideration to whether you want daylight or night time shots and planning appropriately. If you are having an evening wedding but have your heart set on natural light bride and groom portraits outside, having a first look and doing these pictures before the ceremony is often the only solution. I've had wedding marketing experts suggest that I not feature this image so prominently, as it's a rather unconventional shot that is perhaps not instantly identifiable at first glance as a photograph of a bride and groom, but rather is more of a graphical composition. But I think they have been proven wrong by the numerous couples who have specifically gone out of their way to comment favorably about this image. This popular New Orleans wedding venue is a historic building constructed in 1820 which originally housed the Louisiana State Bank. It was designed by famous architect Benjamin Latrobe, who was also responsible for designing the United States Capitol Building. In portions of the interior, fascinating architectural detail drawings are framed along the walls, highlighting various aspects of the building's design.